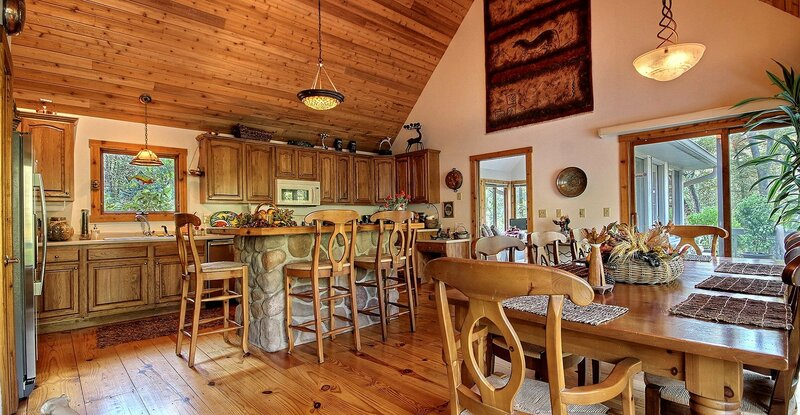 Cherry Ridge Retreat of Hocking Hills combines the privacy and beauty of a woodland paradise with the comforts and amenities of a custom-designed vacation destination. At Cherry Ridge Retreat, your Hocking Hills Ohio Lodging destination, we focus on quality, not quantity: each cabin is situated on its own private site and each site is unique. Situated on 140+ forested acres, Cherry Ridge Retreat is strewn with wooded paths, ambling streams, serene ponds and private picnic areas as well as stunning waterside gazebos where you can join other guests for a sunset cocktail. Each Luxury Cabin is sited to maximize the views while insuring absolute privacy. Whether your preference is water or woods our private Luxury Cabins offer uninterrupted view sheds of pristine water features and of the surrounding hills and forests. 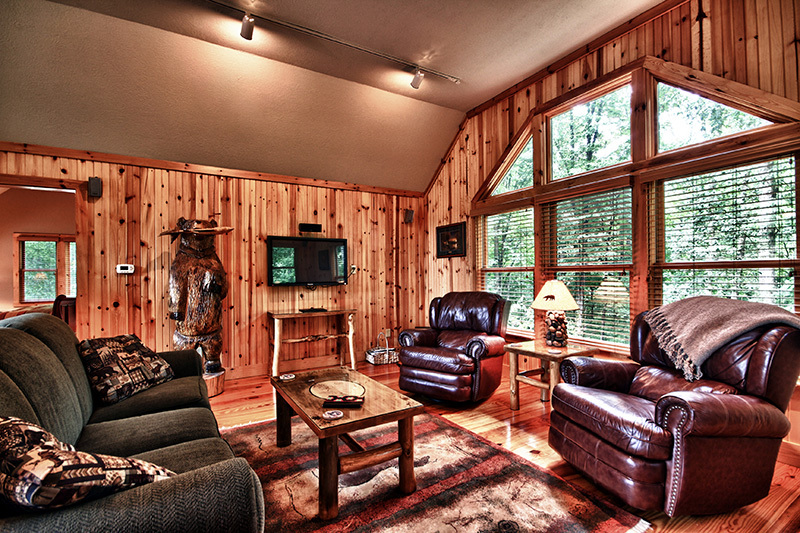 If your goal is to get away from it all while maintaining only the highest standard of luxury, the Luxury Cabins at Cherry Ridge Retreat of Hocking Hills are for you. These one-of-a-kind cabins promise to be an address of distinction for a discriminating few. The Boat House at Cherry Ridge Retreat is a world-class Ohio resort in the heart of the Hocking Hills. Situated right on our 2.5 acre lake, The Boat House offers breathtaking views of the lake through the picture window in private sauna. The Boat House also features a private lake side sauna and large expansive dock. Make memories that will last a lifetime! Ravine’s Edge at Cherry Ridge Retreat of Hocking Hills is defined by one-of-a-kind quality with breathtaking views of wildlife in their natural habitat. Ravine’s Edge will become an address of distinction that promises a richness of life reserved for a discriminating few. Perched atop a lush hill, The Observatory features sweeping views of the surrounding area, taking advantage of the unique topography and extraordinary privacy that are unique to Cherry Ridge Retreat of Hocking Hills. From your secluded poolside deck, you can enjoy unparalleled stargazing while taking advantage of the signature luxuries that have become a hallmark of Cherry Ridge Retreat. 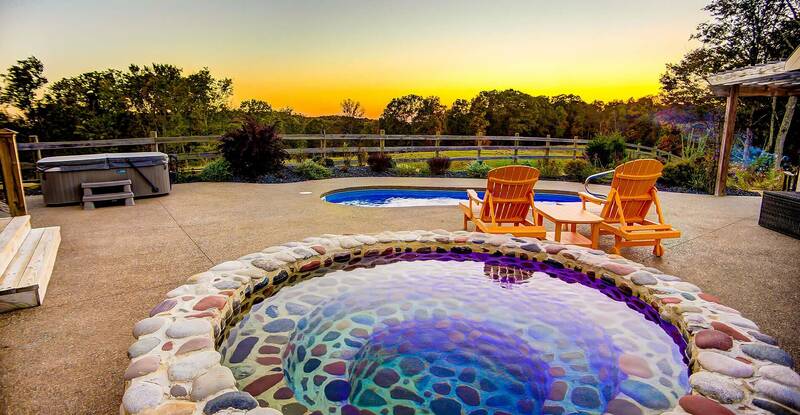 The Observatory features its own Celestron Astromaster EQ Telescope, a Hot Springs Hot Tub situated to take advantage of the views, an in-ground cold plunge water feature and a seasonal in-ground heated swimming pool, to provide you with your very own Ohio Spa-in-the-woods. Each of our romantic cabins is situated on a unique plot on the property, ensuring perfect views and absolute privacy. 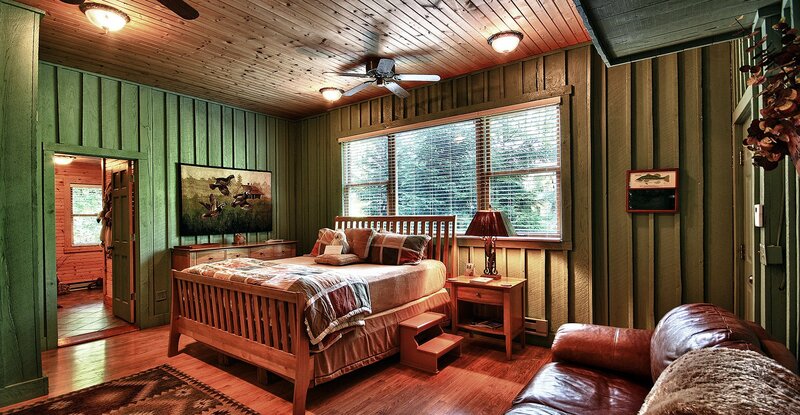 At Cherry Ridge Retreat of Hocking Hills, only the best is good enough. Each romantic cabin rental accommodation includes one or two bedrooms with artist designed furnishings, an immaculate gourmet kitchen, a pristine bathroom with Aveda toiletries, private cabana with a deluxe hot tub, fire pit with comfortable seating and much, much more. Oak Ridge is situated on a heavily forested ridge in the Hocking Hills and derives its name from all of the red and white oak trees that surround it. Oak Ridge has a sliding glass door from the master bedroom leading directly to the gazebo and NEW 4-person hot tub. Whispering Pines is situated next to a private pond with seasonal (summer) fountain, both of which may be viewed from the pond-side gazebo with NEW 4 person Hot Springs Hot Tub or from the pond side fire pit with Adirondack chairs. You won’t believe the feeling of sitting in the hammock or next to the fire pit as you listen to the water splashing and the frogs chirping. Still Waters overlooks our Central Pond and Gazebo Area – this area is lit at night and creates a mystical illusion when viewed through the trees in the evening. The fire pit at Still Waters is both intimate and private yet has dramatic views of the surrounding topography. Our new Deluxe Sundance 4 Person Hot Tub is situated in its own gazebo, creating your very own Spa in the Woods. Generous living space for up to 4 persons (children welcome). Stunning views of our Central Pond and Gazebo! The new fire pit at Water’s Edge is both intimate and private yet has dramatic views through the woods of two illuminated ponds. Our new Deluxe Hot Tub is situated in it’s own gazebo, creating your very own Spa in the Woods. Generous living space for up to 4 persons (children welcome). 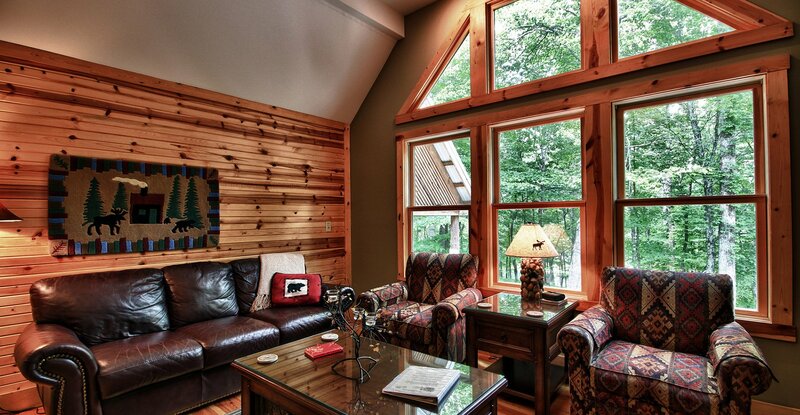 The Lakefront Lodge is the ultimate family retreat in Hocking Hills. Situated on a stunning lake surrounded by mature trees, the Lakefront Lodge at Cherry Ridge Retreat of Hocking Hills is uniquely sited to maximize your enjoyment of your surroundings. Featuring sumptuous living spaces, large picture windows, garden terraces and a stunning waters-edge gazebo, the Lakefront Lodge is one of the premier accommodations at Cherry Ridge Retreat. The open-plan interiors feature vaulted ceilings and large expanses of glass for an optimally spacious environment that brings you closer to your beautiful surroundings. The large living rooms include comfortable seating and a deluxe array of entertainment options including large flat screen HD TV’s, Blu-Ray player, stereo and satellite programing options with SIRIUS music channels. A telephone land line with free long distance is included. Spacious bedroom suites include sleigh beds with deluxe pillow-top mattresses. Bathrooms are well appointed with deluxe features and Aveda bath products ensuring that you will feel pampered in the woods. Our fabulous kitchens will satisfy the true gourmet with state-of-the-art appliances, large countertops and custom designed cupboards and cabinets. Accessories include: coffee maker and grinder, blender, food processor, stainless cookery and much, much more. Custom lighting accents rich cabinetry and beautiful countertops. Deluxe, gas grills are at each location. Outdoor amenities include new state-of-the-art hot tubs in a private setting, sited to maximize breathtaking views of wildlife in their natural habitat. Other outdoor amenities vary by location and may include lakeside gazebos, fire pits, heated swimming pool and cold plunge. Unlike most cabins in the woods, these cabins are beautifully landscaped – giving you the feel of an upscale home in a prestigious neighborhood but without surrounding homes, noise and traffic!